Reddit co-founder Steve Huffman has teamed with Adam Goldstein to create new travel site Hipmunk. Like Reddit, Hipmunk is a Y Combinator startup, making this the second time through the program for Huffman. Reddit was founded in 2005 by Huffman and Alexis Ohanian as one of the first Y Combinator startups. The company was also one of Y Combinator’s first liquidity events when it was acquired by Condé Nast. Few startups have gathered such a rabid and loyal fanbase as Reddit – even with a giant corporate parent they recently were able to raise a substantial amount of money from users to help speed development cycles. 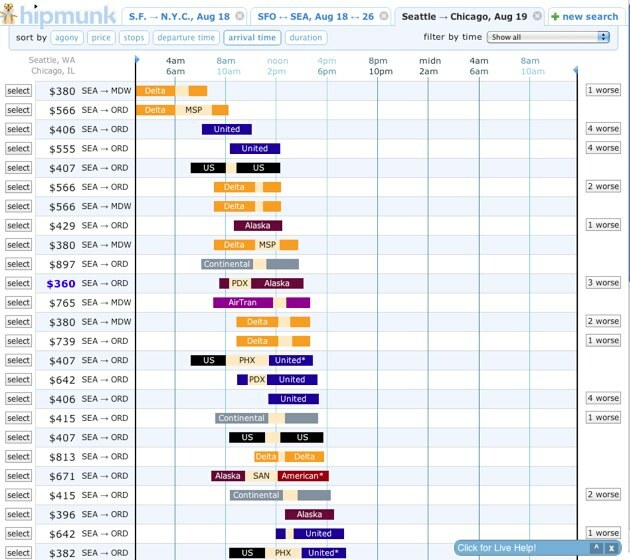 Hipmunk wants to do one thing very, very well: fix the flight search problem. Whether you’re searching on Kayak, Orbitz, Expedia or an airline’s own website the results are often nonsensical – crazy connecting flights like a 17 hour layover in Dallas for a San Francisco to Boston Flight, for example. Or results on multiple pages, making it hard to compare and sort. It’s a mess. Hipmunk only displays flights that you’ll actually want to take, and it displays them in a user interface that shows you exactly how much you’ll pay and how long you’ll be traveling. When you see the results (see screenshot for example), you’ll never want to see flight results in any other format. It’s one of those that’s so obvious why didn’t I think of that moments. And all results are on one long page, making sorting and comparing much easier. Hipmunk also has a tabbed interface for doing multiple searches simultaneously, and users can share links to single searches or all the tabs. And they do a great job with airline preferences. For now Hipmunk is getting it’s data from Orbitz and is referring purchases to them. In the future, says Huffman, Hipmunk will integrate with other travel services. Huffman even got the old Reddit band back together, recruiting Ohanian as a consultant to design the site and mascot. Hipmunk has raised a small angel round from Ron Conway’s SV Angel. That’s in addition to the $15,000 or so that Hipmunk received from Y Combinator.